Some lenses are introduced and quickly revert to near anonymity, while others garner a great deal of photographer interest – even prior to their availability. This lens fell into the latter category, which prompted me to promptly get my hands on one. The reason for this interest? The Samyang 24mm f/3.5 Tilt-Shift Lens is, by far, the least expensive tilt-shift lens available in Nikon or Canon mounts - and possibly the only tilt-shift lens option for other brand DSLR cameras (Sony, Olympus & Pentax). While I reviewed the primary brand for this lens, Samyang lenses are also sold under the Rokinon brand name. I see no reason to choose one brand over another - other than that you like one name better than another. Before reading any further, you need to know that this lens, like all other DSLR tilt-shift lenses, is manual-focus-only. What you also need to know is that, like all other currently-available Samyang DSLR lenses, this lens is manual-aperture-only (1/2 stop clicks). In other words, aperture is able to be set via a lens ring, but not electronically in-camera. Aperture is also not recorded to the image EXIF information. While the latter is not that important to many, it is a pain to us reviewers who need to know which aperture various photos were capture at for evaluation purposes. The absence of aperture value in EXIF is also detrimental to those wanting to learn from their performance in the field. This review did not include the extensive field use that most of the reviews on this site have involved (and the associated sample pictures), but the information presented here should be plenty accurate enough for you to make a purchase decision regarding the Samyang 24mm f/3.5 Tilt-Shift Lens. This review is also not going to discuss the tilt, shift and rotation features of this lens. I discuss these features in depth in the Canon TS-E 24mm f/3.5 L II Tilt-Shift Lens review. The Canon and Samyang lenses are identical in these capabilities aside from the Canon providing a full 180° of lens rotation while the Samyang provides only 90°. The Canon's full 180° rotation allows the main shift knob to be rotated to the bottom of the lens – where it has no clearance issues with the built-in flash housing on many of Canon's so-equipped DSLRs. 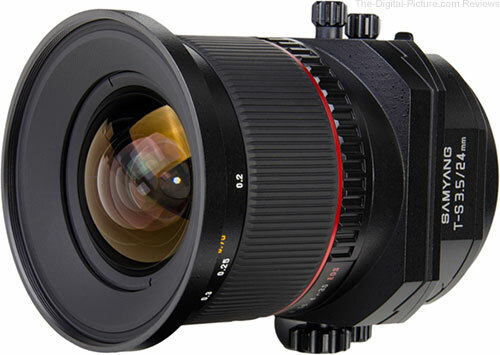 The Samyang utilizes a narrower knob that also clears the housing (Canon also provides a smaller knob for this purpose). So, these two lenses are essentially equivalent in their movements. Do not allow my omission of this discussion detract from the incredible usefulness of these movements in this lens. They are a big deal – I use them – definitely read the referenced Canon review if you are not already familiar with these features and their advantages. The 24mm focal length is probably my most-used for landscape photography with a full frame DSLR. The tilt feature, enabling greater control over depth of field, adds significant landscape photography value to this lens. This is also a great architecture focal length – with perspective-correction (via the tilt movement) being a value add for this lens. Other 24mm uses include environmental portraits. APS-C DSLR owners will realize an angle of view equivalent of a 38.4mm lens on a full frame camera. This focal length, while still suited for landscape and architecture photography, is perhaps better suited for product and loosely-cropped portrait photography than the 24mm angle of view. "Thanks to the advanced optics and sophisticated mechanical construction, this new Korean lens comes as a highly competitive tool which may outdistance other products in this category." While I'm sure that marketing can put the right spin on this statement to make it factual even without the word "may" being included, but that word shows some wishful thinking. And from an image quality perspective, wishful is about as far as this lens goes – unless you stop down to at least f/5.6 or f/8. With a wide open aperture, the Samyang 24mm f/3.5 Tilt-Shift Lens delivers blurry image quality. It's just ugly. Do not plan on using this lens at any aperture wider than f/5.6, or better yet, f/8 (especially for full frame corners image quality). Use the "Image Quality" tool link at the top of this page to see the lab test results for yourself. I also did some outdoor image quality testing with this lens. 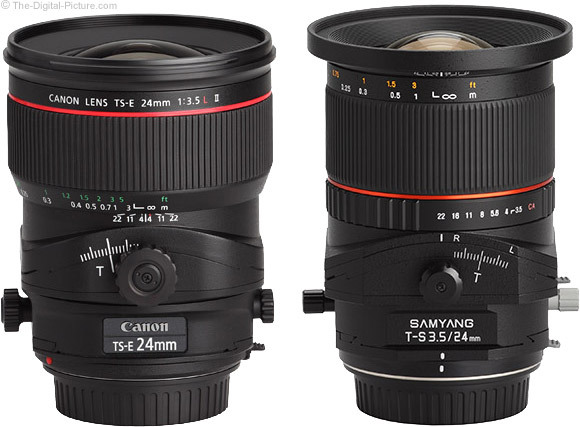 Following is a comparison between the Samyang 24mm f/3.5 Tilt-Shift Lens and the Canon TS-E 24mm f/3.5 L II Tilt-Shift Lens. These 100% Canon EOS 5D Mark III-captured crops were taken from a section of the frame about 1/3 of the distance from the center to the full frame corner – still within what should be the sweet spot of the image circle. Comparisons over the entire frame are similar to this one. Again, the bottom line is that you are going to want to use narrow apertures when shooting with the Samyang 24 Tilt-Shift. The Canon option delivers very noticeably better image quality – it as sharp at f/3.5 as the Samyang is at any aperture in this comparison. Comparing better is the Samyang T-S 24's vignetting - showing very slightly less than the Canon option (about 1.5 stops vs. 1.8 stops) at f/3.5. 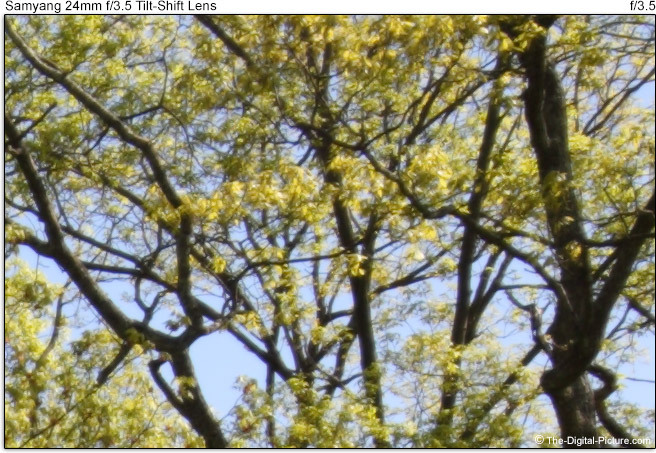 Thanks to their larger image circle (needed for the movement functionality), tilt-shift lenses often show less vignetting than their non-tilt-shift prime lens counterparts at their wide open apertures. Evening the score is that most non-Tilt-shift lenses have wider apertures and therefore compare more closely at the not-so-wide f/3.5 aperture. By f/11, the differences between the Canon and Samyang lenses are minimalized, but I'd still take the Canon results if I had the choice. Also better-comparing is CA (Chromatic Aberration). Only a minor amount of CA shows in extreme full frame corners. If a bright light source is in your frame, the Samyang 24mm f/3.5 Tilt-Shift Lens is going to show some flare – especially at narrower apertures – the ones you want to use with this lens for image sharpness reasons. Even though they have the same number of lens elements/groups (16/11), the difference in flare between this lens and the Canon is obvious. If bright, out-of-focus point light sources are in your frame, you are going to know that this lens has 6 non-rounded (or only slightly rounded) aperture blades. You will know this because of the hexagonal shapes of those blurred points of light. An you will likely find an unusual X-pattern as well. Here are two examples. The blue light is an LED on my monitor and the other blurs are from ceiling lights reflecting on shiny plastic. If you are buying a tilt-shift lens for perspective correction (the shift movement), you probably care about distortion as well. And unfortunately, this lens has more than an average amount of distortion (barrel) for a prime lens. Distortion can be corrected during post processing, but it is a pixel-level-destructive/image quality-degrading process. If you are correcting for lens distortion, you can also correct perspective distortion at the same time. This all devalues having the shift feature in the first place. As you are probably guessing by now, I'm feeling a let-down by the overall image quality of this lens. I mentioned early in this review that the Samyang 24mm f/3.5 Tilt-Shift Lens is a manual focus-only lens. This places greater importance in the smoothness of the focus ring. 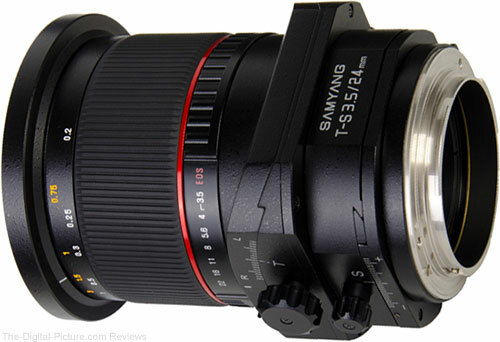 And Samyang has done well with this part of the lens design. The focus ring is nicely sized, is very smooth, has no play and has an ideal amount of dampening. The Samyang T-S 24 extends slightly (0.17", 4.3mm) as the focus distance is shortened. You'll barely notice the change. The filter threads remain stationary. Those considering use of this lens for video recording should note that the change in subject size as the focus distance range is traversed is noticeable - more so than the Canon option. A DOF (Depth of Field) scale is present. Present is more than many lenses made today (especially zoom lenses) can claim, but the scale is not highly detailed (f/5.6, f/11 and f/22 marks) – and it is rather small. A nice range of short distance focus distance markings (in ft and m) are present. Adjustment past the infinity mark is possible. Samyang does not specify MM (Maximum Magnification) for the Samyang T-S 24. The Samyang has a shorter MFD (Minimum Focus Distance) spec than the Canon TS-E 24 L II - 8.3" (210mm) vs. 7.9" (200mm). But, the Canon MFD-tested slightly shorter than its spec - 7.95" (202mm). The Samyang also MFD-tested shorter than its specs (7.72"/196mm). I did not compare the MM of these lenses side-by-side, but the Samyang should about-match the Canon's very-nice 0.34x MM capability. Both lenses are strong in this regard. I did not test the Samyang lens with Canon extenders, but there appears to be sufficient space allowance for them to mount. 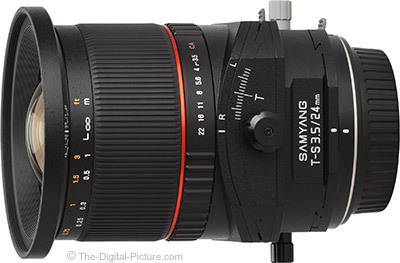 The Samyang 24mm f/3.5 Tilt-Shift Lens has a good build quality. The lens is solid with a nice feel. The movements are smooth. The knobs are a bit small (especially the lock knobs), but aside from increasing the discomfort to the fingers using them, they work fine. The lock knobs are a gray color while the main knobs are black. The color coding makes it easier to find the right knob, but makes the use of plastic very obvious. The aperture ring is 1/2 stop-clicked and has a very coarse, plastic rib that makes it easily identifiable from the focus ring via touch. It works fine. If you do not count the two rotation movement release levers, there are no switches on this lens. Exactly 0. The overall design of this lens is somewhat blocky. The Samyang T-S lens makes less use of rounded corners than the Canon TS-E and the big overhang at the end of the lens (narrower focus ring than Canon's) practically gives the Samyang a handle. See the side-by-side image comparison below. 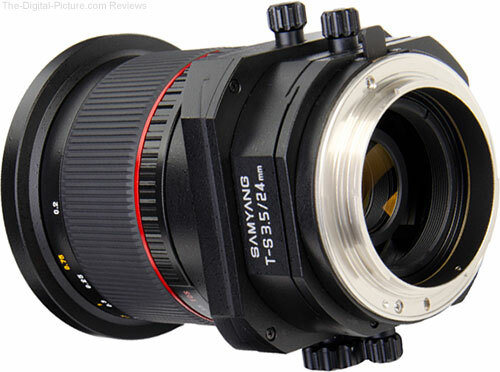 The Samyang T-S 24 is a medium size and weight lens. It is very similar to the Canon TS-E in this regard. 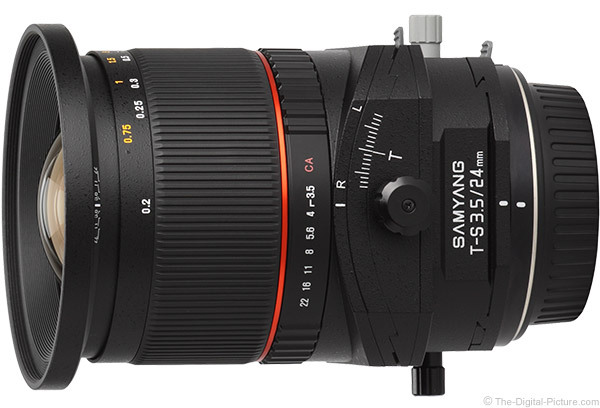 For many more comparisons, review the complete Samyang 24mm f/3.5 Tilt-Shift Lens Specifications using the site's Lens Spec tool. Here is a visual comparison of these same lenses positioned in the same order as the above table. I usually provide a with-hoods comparison image, but ... the Samyang does not even have an optional hood. No hood is no big deal with this lens. I'm a hood user, but I have to admit that I sometimes leave the Canon TS-E 24mm L II lens hood at home. It is shallow (to avoid blocking the image circle when tilt and/or shift movements are being used) – and wide. The shallow aspect means that it does not offer much protection (from light or impact) and the wide part means that it requires a much greater diameter in a camera case or backpack. 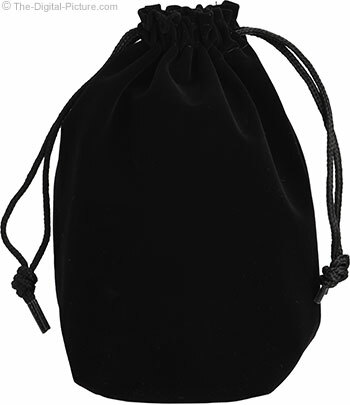 A thin lens pouch is included in the Samyang box. You will want a different case for much more than dust protection. The reviewed lens, like most on this site, was purchased off-the-retail-shelf. I generally include a short warning about potential compatibility issues with non-camera-manufacturer brands, but ... I see very little risk with this lens as it is completely manual. There is little to not be compatible with. Getting this lens repaired is a bigger risk as Samyang's repair reputation, at least in the USA, is not yet well-established. 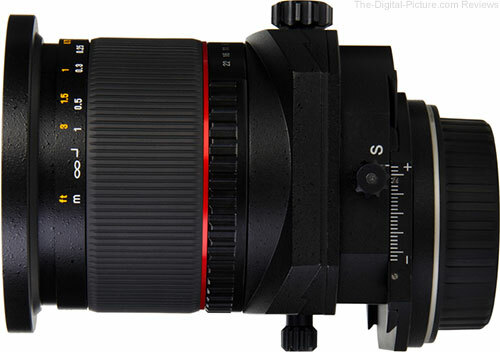 The only reason I would consider purchasing this lens is if I needed the tilt, shift and rotation movements. 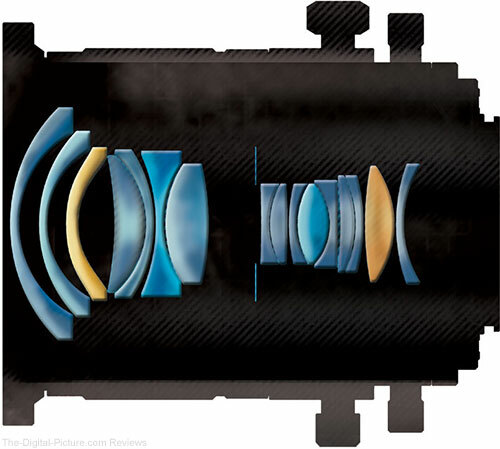 Otherwise, less expensive lenses with better image quality are available. As mentioned throughout this review, the Canon TS-E 24mm f/3.5 L II Tilt-Shift Lens is going to be considered the primary Samyang 24mm T/S lens alternative. The Canon is the at least equivalent and usually far better option – especially in the image quality department. Of course, the Samyang costs 1/2 as much as the Canon - $1,000.00 less as I write this. That leaves a lot of extra weight in your wallet. Still, the Samyang 24mm f/3.5 Tilt-Shift Lens is far from an inexpensive lens – and I expected better image quality from a completely manual lens that costs as much as this one. If you settle for this Samyang lens, you will want to favor narrow apertures. And you will probably want to use manual exposures (set the shutter speed yourself also).